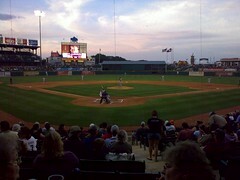 We are pretty lucky hear in Austin to have a AAA baseball team. The Round Rock Express are in the Houston Astros farm system. I am pretty lucky to have some contacts in the bar industry here in town and get invited a couple of times a year to Express games. Yesterday I got invited to hang out in the Capital Beverage suite. Plenty of hitting and lots of sloppy field play last night. The Express won 6-5 over the visiting Omaha Royals. 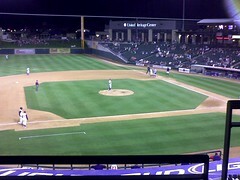 Dell Diamond is a great park. I recomend it to anyone who likes baseball. Tickets are cheep ($6 for the berm, $13 for box tickets) and the play is usually pretty solid. Rain and hail in Austin again today. Hope it rains hard, but hails light. We need the rain but not the damage. I did make it to the Chris Cornell concert at Stubb’s the other week. I enjoyed it, although it was a late night and Tuesday hurt. I also cut my finger trying to crush a can into the recycling bin. Grrr. Last weekend, my friend Chris wanted to know if I wanted to see the Plain White T’s at Antone’s. I like a couple of their songs and it was only $20 so I was in. Danger Radio, from Seattle, opened. They have a very cool tech streak and really enjoyed themselves. Not bad- even though the set was only about 45 minutes. The Plain White T’s are also a pretty fun band- they did a three part show calling a “Three Part Harmony” where they separated their sets into a intro set, an acoustic set, and then a final set. We were out by 11pm and back to my house well before midnight. The next day didn’t hurt as bad. There were more kids there then I could count. Tons and tons of 16 year olds. Another friend described it as “almost as bad as a Switchfoot concert”. I can’t disagree. The Gaslight Anthem is playing at Antone’s later in the month. Tickets are cheap too. I saw them on Dave Letterman awhile back and do got the album off of iTunes, so I will probably try and make that one. This weekend is the Masters. I got to watch/listen to a bunch while I worked at home yesterday but won’t get to see much today. I certainly will be watching Saturday and Sunday. I don’t have any Easter plans, but will probably do a Sunday dinner. Saturday night is Blue October at Stubb’s. I have seen them a couple of times live now so when I heard this concert was coming up I was on it. They are doing two sold out nights here in Austin- so you know it will be crazy downtown. Oh, and Sunday is also Mom’s birthday. Happy birthday Mom! I got a Nokia E71 yesterday. Time to jump on the smart phone bandwagon and I didn’t want a new contract to get an iPhone. It has G3 Web, GPS, Media Player, an Radio, and does WiFi. I like it so far. Hopefully I like it a lot because it wasn’t cheap.